Our first show of 2014 and the main subject of conversation is Brand. What is that, and what does it mean? we’ll also talk about Google Plus and tax, a surprisingly popular topic last time out so we’ll explore a bit more. Allow me to introduce this weeks Knowing Your Business show guests, with their podcast, websites and social media links. Sarah Kennard explains life as Brand Sarah Kennard, a Holistic Wellbeing Coach for businesses. In November of 2013, Sarah was presented with an opportunity to take redundancy from her longstanding corporate career in customer service. It didn’t take her long to say yes please. Sarah has known for a long time that her heart lies in helping people and while Sarah had some opportunity to do this is her everyday role, it was limited as her focus was on the harder commercials. Sarah left her job in December 2013 and is now focusing her time 100% on her holistic wellbeing business brand. Lou Ellerton from the Value Engineers gives us their favourite definitions of brands. Some people want the creation and communication of brands to be a precise science; others prefer to think of it as a black art. But what exactly is the media talking about when it refers to brands? While most people will happily agree that the likes of Apple, Nike and Google are ‘brands’, few are able to define what they mean by that. Even within the marketing industry, people disagree as to what exactly makes a brand. Lou has been a Senior Consultant at The Value Engineers for nearly four years managing and delivering senior-level client projects in strategy, branding, innovation and insight. Recent clients include Expedia, Everything Everywhere, Ginsters, Unilever Italia, PepsiCo and France Telecom. Ian Gentles talks about developing YOUR Brand presence on Google Plus. Having worked in search, social and digital owned properties since 2007, Ian is convinced Google+ Is your key to Brand visibility in Google search. Ian explains why Google’s objectives with Google+ is to integrate, identify and authenticate users across its other products that includes Google Maps, Google Local, Gmail, YouTube, Google Play, Google Events, etc.and how that can work for your business marketing. Matt Lewis Financial VAT Expert from Concur talks Tax at 11:35am. Less than a third of small businesses always claim on VAT expenses and less than one in ten claim 100% of that, while less than a quarter always reclaim VAT on business mileage claims. Based on these figures, it’s probably no surprise that three quarters of small businesses wish they knew more about employee expenses and VAT reclaim. Furthermore, less than 40% surveyed by Concur are certain their organisation complies with HRMC regulations and more than 40% are worried about HMRC coming to inspect their business. The biggest concerns about not complying are a damaged reputation (37%), monetary fine (28%) and lost working hours (19%). 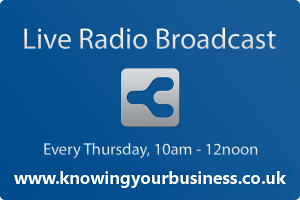 This weeks Knowing Your Business show wass presented by Ian Gentles and guest presenter Joy McCarthy.